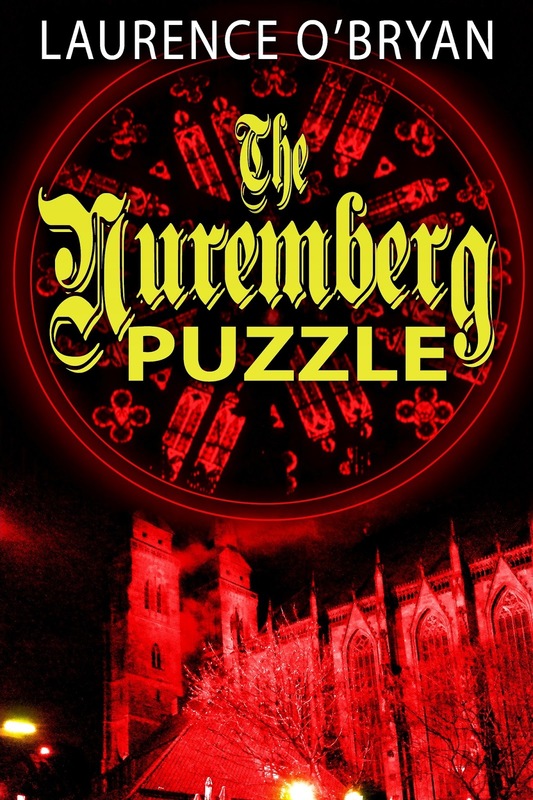 Author Laurence O'Bryan publishes his latest book - The Nuremberg Puzzle - today. He visits the blog for a discussion about his latest work, his writing - and the shocking link between the Catholic Church and Adolf Hitler that he discovered during his research. 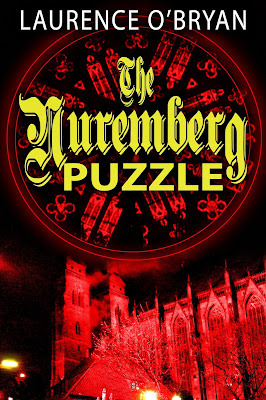 I wrote The Nuremberg Puzzle, a contemporary mystery, because of what I discovered about the Vatican’s support for Adolf Hitler. What I learned shocked me, deeply. The Nuremberg Puzzle is about the modern day hunt for the letters that the Pope at the time, Pope Pius XII, wrote to Adolf Hitler. His copies of these letters were destroyed by his personal secretary when he died in 1958, without ever having faced a judgement for the crucial support he gave to the Nazi regime. The story sees Sean Ryan travelling to Nuremberg, as German fascists plan to rid Europe of refugees comes to a genocidal head. This post will give you some historical background into why I had to write this book. The historical puzzle, which bothered me for a long time, about the genocide that Adolf Hitler and his henchmen perpetrated on millions, is why did the German people go along with his murderous madness? Anti-Semitic propaganda was one of the main ways the Nazis turned the German people into killing machines. But I always wondered where he got these ideas from. Here’s some examples of what appears clear to me, that Catholic Anti-Semitic propaganda in the previous decades, was the source of these evil ideas. The most influential Catholic newspaper in those decades was Civilta Cattolica. Published since 1850 by the Jesuits. A forty month campaign against Jews began in the newspaper in 1880. The Jesuit author, in one of the first articles, wrote that Jews were “obligated by their religion to hate all non Jews,” and that that was why they were despised. The aim of much of this propaganda was to force Jews to be housed again only in ghettos. The Papacy had been forced to open the Roman Jewish ghetto in 1870, when Rome was captured by the Italian Army and the Papal States were overthrown. One article in Civilta Cattolica stated that “if this foreign Jewish race is left too free, it immediately becomes the oppressor, tyrant, thief, and the devastator of the countries it lives in". In 1884 an article was published proposing that Jews be treated as “strangers, not as citizens". This idea of segregating the Jews, forcing them into ghettos and then concentration camps, because they were not citizens of the state, was the foundation idea for the Nuremberg Race Laws of 1935, directed mainly against Jews. An article in Civilta Cattolica in 1893 reiterated the ritual murder charge, that Jews murdered Christian children for their blood, and blamed Jews for devising the capitalist system to enslave Christians. This is the environment that Adolf Hitler was born into, as a Catholic, in a militaristic Catholic country, Austria, in 1889. “Not until my fourteenth or fifteenth year did I begin to come across the word ‘Jew,’ with any frequency, partly in connection with political discussions…. It’s one thing for some warped maniac to concoct ideas about racial superiority, we still have such idiots, but it’s another for him to persuade millions that mass murder is the answer to the problem. Investigating the source of Hitler’s anti-semitic ideas, provides an explanation for where these ideas came from and why they took root, but the missing piece for me, being brought up in a so-called “Christian” country, was how many millions of Christians could reconcile a belief in “love thy neighbor as thyself,” with a willingness to murder men. women and children, because of their race. It is to the Christian Churches that I look first for an explanation, as they were hugely influential at all levels of German society in regards to matters of morality. Why did they not speak out, as a group, against Hitler’s crimes? Let’s look at some matters, which I believe were influential to the culture of that time. In Hannah Arendt’s book, The Origins of Totalitarianism, on page 102, she speaks about the Jesuit statutes which forced each novice to prove that they had no Jewish blood “back to the fourth generation.” The anti-semitic Jesuits, she notes, controlled the Vatican’s international policy from the early 19th century. But the single most important reason, as to why Germans went along with Hitler, was that the Catholic Church was the first international power to recognize Hitler’s regime with a treaty, a Concordat, ratified September 10th, 1933, only months after he came to power. It was obvious to all that Germany had been taken over by a raving anti-semite, and a party which in 1930 had attacked and killed 8 Jews in Berlin, and which harassed and abused Jews in streets, shops, cafés, and other public places. Yet the Vatican was the first major power to give legitimacy to these murderers. From this Concordat, German Catholics and other Christians would have known that murderous anti-semitism was compatible with Christianity, in the opinion of the leaders of the Catholic Church. This shameful Concordat has never been repudiated, to this day, and still stands as the treaty from which German’s unapologetically wealthy Catholic Church extracts a religious tax, as part of the payroll tax for those who agree that they are Catholic in all Germany. This same Concordat required that all Catholic clergy pledge an oath of allegiance to the Fuhrer. Hitler ensured that he got the public allegiance of the clergy in exchange for the pieces of silver passing to the Church. Bishop Berning visited “a number of concentration camps” and in a reported speech to camp guards praised their work, and ended the speech with three Seig Heils, for the Fuhrer. These were the only words any leader of the Church had spoken about the well known murderous barabarity being perpetrated, even at that time, in these camps. It was glaringly obvious to all that the Catholic Church approved of Hitler’s murderous policies. For German citizens, brought up to obey their leaders and their church, there would have been little option, but to comply. To order The Nuremberg Puzzle click here.